Kleinmond Lagoon running into the sea. Kleinmond meaning small mouth is a growing town on the the southern coastline of the Western Cape. It is bounded to the east by the mouth of the Bot river which forms a large lagoon and on its western side by the mouth of the Palmiet River. 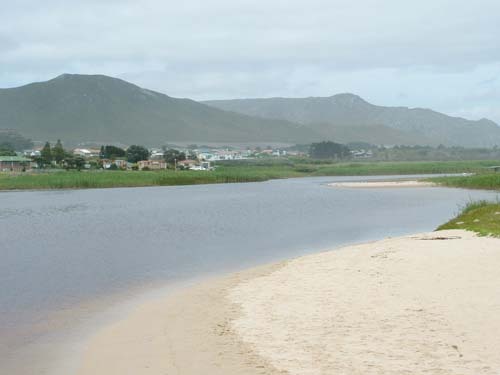 The Botriver lagoon has a small stream running from it behind the sand dunes that form a barrier between the sea and the mountains and which empties itself into the sea near the Kleinmond village. It is this small mouthed river which gives the town its name. Approaching Kleinmond from the east the coastline consists of a mountain range on the northern side of the road and a strip of land with the small river and some small lagoons where the river has dammed up. On the sea side of the sand dunes is a pristine white beach. Arriving in Kleinmond on our right is the Klein Botriver lagoon which enters the sea near the Kleinmond Hotel. The mouth is not always open and the water dams up especially during the summer months. When the winter storms lash the area and the river fills up it opens the mouth which then becomes tidal. The sea at the mouth becomes very dangerous as there are fierce currents which can drag an unsuspecting person into the sharp rocks found under the water a short way off the beach. These rocks are where fishermen come to fish. There are a number of spots where the local delicacy “The Galjoen” bite. It is not a fish that one can buy anymore as they are on the endangered list. Anglers are only able to catch a few fish each day for their own use. Kleinmond and the area from the Botriver Lagoon to Cape Hangklip in the west have being declared the Kogelberg Biosphere Reserve. This means that the area has to be developed in terms of international standards with as little disruption to the natural environment as possible. The reason being that there are a number of natural resources in the area which attract attention. Firstly there is a herd of wild horses which roam the marshlands around the lagoons. Apparently the only wild herd in South Africa that roam a wetland area. A number of endangered frogs also live here, they are the Cape Platanna and the Cape Strawberry frog. I've never seen one but must be a red frog to be named after a strawberry. The town of Kleinmond dates back to the 1860's when farmers from the Caledon area used to visit the area for their holidays. There are two campsites in the region and one is found near the entrance to Kleinmond from the east. The other one is on the western side near the residential village of Palmiet which is a suburb of Kleinmond at the mouth of the Palmiet river. Kleinmond is the hub of the area being the commercial centre and is growing at pace. A number of shopping centres have sprung up and sell anything from building materials to food and liquor. The coastline between Palmiet river mouth where there is a lagoon and the hotel at Kleinmond is very rocky and makes for good fishing in all the little gullies where fish hideout. The beach around the mouth of the palmiet river is and white. The Palmiet river is quite an important river in the area as it starts in the mountains above Grabouw, and is dammed downstream at two or three places to supply water to the apple farmers in the region. 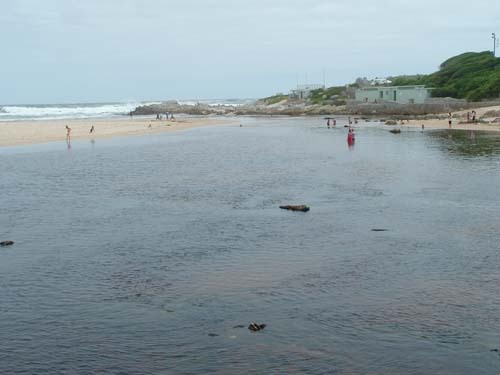 As one drives futher west towards False Bay one has to cross the Palmiet River. Under the bridge are a couple of small cliffs where people dive off into deep water. Higher upstream there is also a section of river where white water rafting is carried out. Kleinmond is well worth a visit especially for those who love nature. There are many walks where one can get to grips with the Fynbos that grows there. There are many species of protea and heather growing in the wild. When the flowers come into bloom in early Spring the mountains turn into one big flower garden. Last but not least, from June to December the whole coastline is home to the Southern Right whales. Good viewing spots exist all along the coastline and especially near the hotel where the whales come close inshore. Why not come and explore the area for yourself, you will be glad you did.